Renfrew County Catholic District School Board (RCCDSB) students had a fantastic day in Stittsville at St. Paul Demarais School on Saturday March 3, at the 2018 Regional Destination Imagination competition. “Once again, RCCDSB teams demonstrated amazing 21st Century skills as they competed in one of seven challenges,” says Karen Keels, Principal, Our Lady of Fatima School and RCCDSB Destination Imagination program leader. Destination Imagination (DI) is a non-profit program that helps kids discover their creativity as they work together to solve a problem. “Teams of five to seven students use science, engineering, improv’, technology, performance or community outreach themes as they tackle one of seven Team Challenges,” explains Doug Hunter, Regional Director for Eastern Ontario. This year 40 teams competed from across Eastern Ontario. A large group of volunteers were on hand to ensure the full-day event went off without a hitch, and hundreds of educators, family members and friends were there to support the students in their challenge performances. Eight teams from Kindergarten to High School did an excellent job representing the Renfrew County Catholic District School Board. Two teams from Our Lady of Sorrows in Petawawa competed in the improv challenge. The OLOS Imaginators competed at the elementary level, and the OLOS exploDIng Stars at the middle level. Both teams placed 2nd in their division, to qualify for the provincial tournament in Toronto. Bishop Smith Catholic High School also had two teams in the tournament, one in the improv challenge, and one in the fine arts challenge. 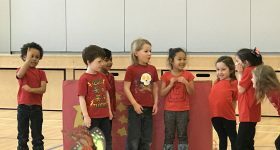 The improv team, Kids on the Wall, placed first in their category, and the fine arts team, The e-Lemon-ators placed third, also qualifying for the provincial tournament. Our Lady of Fatima, in Renfrew, sent four teams. Two teams competed in the middle level engineering challenge, The Drop Zone. The Stone Age team placed third, and qualified to go to Toronto. The Fatima Force team didn’t place in the top three, however demonstrated fantastic skills in solving the challenge. The Fatima Force elementary improv team placed first in their level, and will move on to Toronto. Fatima also had a Kindergarten group, the Fatima Friends, represent in the Rising Stars challenge. “They bravely performed for a large crowd in the school gym, and had a fantastic time,” notes Keels. Keels also acknowledged the efforts of the team managers from RCCDSB who put in countless hours to help prepare students for the difficult challenges. “Thank you to April Laabs, Katie Moyles, Kelli Holm, Ashley Mitchell, Lindsay Morton, Raina Newberry, Elizabeth Addicott, and Janet Goulard,” said Keels. The six teams moving on will compete at the Provincial Tournament in Toronto on April 7 to try to earn the opportunity to attend the DI Global Finals on May 23–26 in Knoxville, TN.